Jesse met his wife Ashlee while attending Moody Bible Institute. They were married in 2009, and now have five children—Jayden, Micah, Elian, Isaiah, and Judah. 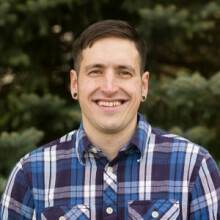 Since his family planted a church in Wisconsin when he was in Jr High, Jesse has been heavily involved in ministry, working at christian camps, overseeing community outreach, and leading youth ministries. Most recently he has been on staff with Harvest Bible Chapel Rockford 2012-2017 as the Associate Pastor of Youth and Outreach. Jesse is passionate about seeing lives transformed by the gospel and encouraging believers to grow in their love for God and His people, and firmly believes in Christ's promise to build His church. It is for this purpose that he is setting out to plant Vertical Church Milwaukee.